I received my M.Sc. in Biological Sciences at Arkansas State University (2011-2013) under the guidance of Dr. Ronald Johnson studying Largemouth Bass. Largemouth Bass are the most popular freshwater sport fish in the United States and recreational angling is a highly important economic activity. 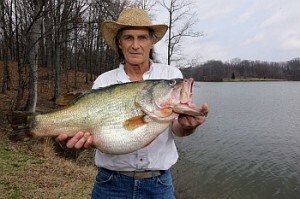 Several Arkansas reservoirs have been stocked with Florida bass (FB; Micropterus floridanus) for decades due to the conjecture that FB have superior growth characteristics compared to the native Northern Largemouth Bass (NLMB; M. salmoides), and therefore improve recreational angling. For my thesis, 1,350 bass were sampled (fin clips! non-lethal!) for microsatellite analysis from seven Arkansas reservoir bass populations to determine levels of FB introgression among populations. I showed that the relative level of FB introgression among reservoirs was highly variables. Reservoirs subjected to renovation with rotenone treatment and subsequent stockings of FB had the highest frequencies of FB alleles, whereas reservoirs stocked with FB on top of a resident NLMB population had the lowest frequency of FB alleles. I published a few papers related to my research: one related to the stocking and incorporation of FB in small arms of large reservoirs (Lamothe et al. 2012) as well as investigating the differential representation of FB among trophy largemouth bass in Arkansas (see photo below: Lamothe and Johnson 2013). The final paper from my Master’s thesis describes the lack of size differences seen between FB, NLMB, and their hybrids among most Arkansas reservoirs stocked for over 20 years (Lamothe et al. 2016).